southern intersection of Westcreek Drive and Old Fredericksburg Road: constructed a pedestrian ramp on the east side of Westcreek Drive and connected it to the existing sidewalk. installed additional fluorescent yellow-green pedestrian signs for existing signs on both sides of Westcreek Drive to warn both northbound and southbound drivers of pedestrians in the area. (signs at the existing crosswalk at Old Fredericksburg and Morning Dew). Since that time, an additional crosswalk was painted at the Old Fredericksburg Road (where it extends next to Klingemann’s) and Westcreek Drive. We have again reached out to Lone Star Soccer to ask that they alert their parents and children to these traffic calming upgrades and to encourage everyone to use the crosswalk and crossing areas. 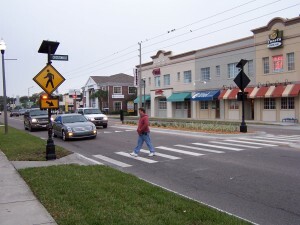 We hope these improvements will also encourage drivers to obey state law and yield to pedestrians at crosswalks. 3. Brush Country Road This road is considered a minor arterial and ineligible for traffic calming studies. Despite this, the WNA has repeatedly attempted to reach out to city staff and we have informed our district's council member that we believe we should have traffic calming on this street. 4. Cut-Through Traffic The WNA has worked very hard to oppose additional development in the area that will contribute to additional cut-through traffic. Despite our efforts, we have seen the previous and current city council approve more development in the area and we will likely see more cut-through traffic as a result. The WNA continues to present our concerns to our city council representative. We encourage neighbors to do the same. Want traffic calming on your street?